306 pages | 21 B/W Illus. 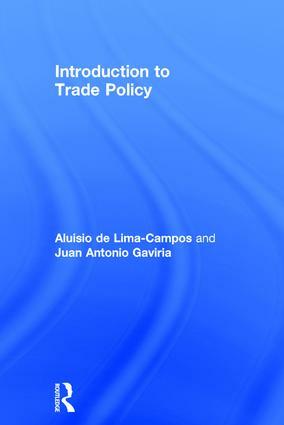 Aluisio de Lima-Campos is an Adjunct Professor at the School of Law at the American University, Washington, D.C., U.S.A., where he teaches courses on trade policy and regional trade agreements in the Trade, Investment and Development Program. He has over 30 years’ experience as a trade policy specialist and economic advisor to the Brazilian Embassy in Washington, D.C., and established the ABCI Institute in 2007, which offers trade policy study and training for Brazilian government and private sector professionals. He is also a former instructor for the Regional Trade Policy courses of the WTO, delivering training to government officials worldwide. Juan Antonio Gaviria is a Doctor of Juridical Science from American University, the Washington College of Law in Washington, D.C., U.S.A. He holds a LL.M. with an emphasis on International Business Law from the same university and was an Adjunct Professor there for the course on Advanced Issues in International Trade Policy. He has over 15 years’ experience as a legal practitioner in trade and business law and also as a professor and academic researcher. Besides trade law, his main academic interests lie in the intersection of legal and economic topics. He is a tenured Professor and Researcher at Universidad Pontificia Bolivariana, School of Law (Medellín, Colombia) and member of the Research Group on Legal Studies (GRID) at the same university.